I love movies--but, find it difficult to find a family friendly movie suitable (and interesting enough) for our entire family to watch. My husband enjoys comedies, I enjoy action movies and the girls drift toward animated movies or movies focused on teens. We recently had the opportunity to watch and review PIRATES CODE: THE ADVENTURES OF MICKEY MATSON. (I also have a copy for one lucky reader to win at end of this post!) This movie seemed to have something for all of us with humor, action, adventure--with young stars and a well known name in Christopher Lloyd. What did our family think of PIRATES CODE: THE ADVENTURES OF MICKEY MATSON? We received a complimentary copy of this movie for use in our review. All opinions are our own. Quick Summary of PIRATES CODE: THE ADVENTURES OF MICKEY MATSON. In this follow up to Mickey Matson and the Copperhead Treasure, Mickey Matson is at it again; this time pitted against the evil Admiral Ironsides and his gang of pirates who are intent on destroying civilization. Their new invention, the Tesla Coil, is a weapon of mass destruction that will send an electromagnetic pulse throughout the world, destroying every electronic device in existence. With the help of a secret organization, Mickey and his best friend Sully embark on a mission to stop the pirates from taking over a submarine and stealing the last part needed to complete their devastating weapon. If Admiral Ironsides succeeds in his plan, civilization will be sent back to the Stone Age. It's a race against time, and the fate of the world hangs in the balance. PIRATES CODE: THE ADVENTURES OF MICKEY MATSON is a family friendly action adventure movie. The kids love action and adventure; but, most action movies aren't family friendly. The violence is too graphic or the costumes are too revealing or the the scenes are simply too realistic. 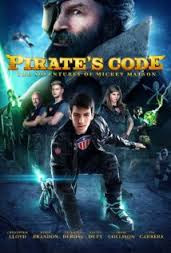 PIRATES CODE: THE ADVENTURES OF MICKEY MATSON is a family friendly action movie. Parents may cringe a bit at the unrealistic scenes and the comical violence--but, there isn't really much in the movie that the kids cannot watch and enjoy. Kids may like the movie more than parents. Okay--depending on your sense of humor, your kids may enjoy the movie far more than you do. I am not necessarily a fan of slapstick, "kiddie" comedy--and this movie does offer a bit of that. The grown up actors did try to offer something for the adults--and Christopher Lloyd is always a family favorite--but, PIRATES CODE: THE ADVENTURES OF MICKEY MATSON is really geared toward the kids. Would I recommend PIRATES CODE: THE ADVENTURES OF MICKEY MATSON? We didn't watch the first Mickey Matson movie--so this was our first experience with the characters. If you have an action movie loving family, this movie is certainly family friendly and appropriate for even the younger ones. My daughters found that it kept their interest and they did it funny; although there was some eye rolling from the oldest at times. Having said that the kids may enjoy it more than adults--as a parent, I am still a fan of any movie that we can watch together as a family--and would recommend this movie to others seeking a fun, family movie night idea. Especially for a movie without animation! Learn More about PIRATES CODE: THE ADVENTURES OF MICKEY MATSON.. It would be FernGully for my family. the original sound of music. My favorite family movie will always be The Wizard of Oz. We loved all the Toy Story movies. Our new favorite is Big Hero 6. I personally like the old-school live action Disney movies from when I was a kid. My own kids, however, think they are completely cheesy and prefer anything from Pixar. My favorite family movie is the Bambi. My favorite family movie is The Little Mermaid. My favorite family movie is Toy Story.